Beck has 6 or 7 tracks credited in the 2006 film, Nacho Libre. This is one of them, and is one of only three that were officially released on the soundtrack. "10000 Pesos" is a calm acoustic guitar piece, with loopy bass and some distant "aaah"s. It is very film score-y, and the title refers to the film as well. There are two versions of the song, or more accurately, two different edits of the same track. 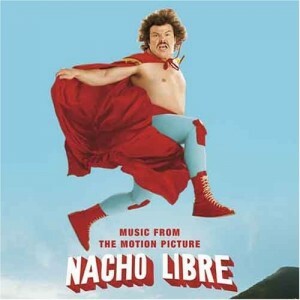 The first is the main one that was released on the Nacho Libre soundtrack. It is 1:59 in length, and begins with a lone guitar for 16 seconds before the drums and another guitar join in. Then after 49 seconds, Beck starts humming. Near the end, someone whistles a little. The second, less-common version is 1:49 in length. The lone guitar lasts for 30 seconds before the other instruments join. The humming starts at 1:05. There's no whistling, but there appears to be some church bell-like percussion at the end. The sound quality is much less clear. I honestly do not remember where the second version came from exactly. (A lot has happened since then.) My best recollection is that the second version was leaked before the CD came out. It may also actually be what's in the film? Then the soundtrack was released and, for some reason, the version on the CD was different.